The MTest beamline has 4 pre-installed scintillator counters (SC) listed below. All SC PMT voltages are controlled from RR7 in MS4, and the signals are fanned-out to various locations as described below. All SC’s can be read out through ACNET. MT6SC1 – located immediately downbeam of the MT5/6 Cerencov detector at the entrance to the MT6.1 enclosure. Upbeam of the MT6WC1 SWIC and TOF1 detectors. Scintillator is 10cm2 and 1/4 inch thick. PMT is a Hammamatsu <model> which runs at a voltage of <insert> volts. MT6SC2 – located immediately upbeam of the absorber at the exit to the MT6.1 enclosure. Downbeam of the MT6WC2 SWIC detector. This SC can be slid out of the beam in case particle scattering needs to be reduced. Scintillator is 10cm2 and 1/4 inch thick. PMT is a Hammamatsu <model> which runs at a voltage of <insert> volts. 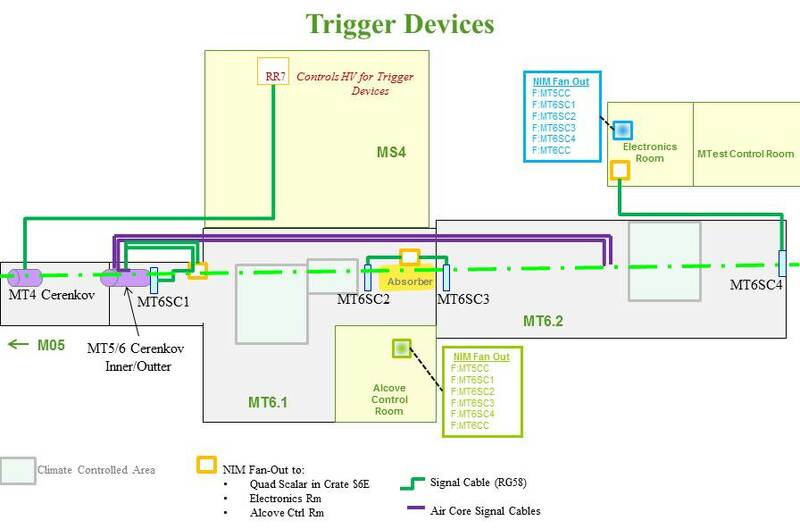 MT6SC3 – located at the entrance to the MT6.2 enclosure. This SC can be slid out of the beam in case particle scattering needs to be reduced, or helium tubes are being used. Scintillator is 10cm2 and 1/4 inch thick. PMT is a Hammamatsu <model> which runs at a voltage of <insert> volts. MT6SC4 – located at the very end of the MT6.2 enclosure. (In front of the beam dump) Scintillator is 10cm2 and 1/2 inch thick. PMT is a Hammamatsu <model> which runs at a voltage of <insert> volts. Additional scintillator counters of various/custom sizes and various widths are available to users upon request. (Just tell us what you need.) Custom sizes never requested before may have to be fabricated, in which case advanced notice (of about one week) is appreciated.